"The reason why I remember her is she was very nice and very smart," said a high school teacher. Katherine Tsarnaeva, widow of Boston Marathon bomber suspect Tamerlan Tsarnaev, leaves the law office of DeLuca and Weizenbaum, with her mother on Tuesday, April 23, 2013, in Providence, R.I.
Katherine Russell was a talented artist, a good student who grew up Christian, the daughter of a suburban doctor. A few years later, she had dropped out of school, converted to Islam and was Katherine Tsarnaeva, wife of a man who would become a suspect in the deadly Boston Marathon bombings and a subject of one of the biggest manhunts in American history. Tamerlan Tsarnaev, 26, and his brother, Dzhokhar Tsarnaev, 19, two ethnic Chechen brothers from southern Russia, are accused of planting two shrapnel-packed pressure-cooker bombs near the marathon finish line last week, killing three people and injuring more than 200. Tamerlan was killed in a getaway attempt after a gunbattle with police. Dzhokhar, who was captured hiding in a tarp-covered boat in a suburban Boston backyard and is hospitalized, was charged Monday with using a weapon of mass destruction to kill. The prosecution of Dhokhar Tsarnaev faces controversy in Washington. Authorities have not released a motive, but two U.S. officials, speaking on the condition of anonymity because they weren't authorized to publicly discuss the investigation, told The Associated Press that evidence suggests the brothers were motivated by a radical brand of Islam. Tsarnaeva, 24, has avoided the public eye since her identity became known Friday. On the rare occasions when she has emerged from her parents' Rhode Island home, she is dressed in the traditional Muslim headscarf, a hijab, and has refused to answer questions. Tsarnaeva grew up with two younger sisters on a quiet cul-de-sac in North Kingstown, a rural, wooded town a 90-minute drive south from the apartment she would eventually share in Cambridge, Mass., with her husband and his family. Her father, Warren Russell, is an emergency doctor whose Facebook profile lists his high school alma mater as the elite New Hampshire boarding school Phillips Exeter Academy and college as Yale. Her mother, Judith Russell, was listed on her Facebook profile as working at a social services agency. Tsarnaeva attended North Kingstown High School, graduating in 2007. Her yearbook entry lists her plans as college and the Peace Corps. Her art teacher for four years, Amos Trout Paine, remembered her talent in painting and drawing and said she was at the top of her class. "The reason why I remember her is she was very nice and very smart," Paine said. "She was ready to learn." She had friends and was well integrated into class, he said, and did not seem to be interested in religion. "There was none of that with her," he said. "She was neutral." She went off to Suffolk University, and Paine did not see her again after that. He said he was surprised to hear she had dropped out of school and even more surprised to hear she was married to a man now accused of bombing the marathon. Suffolk University said Tsarnaeva attended from 2007 to 2010 and majored in communications. Her lawyer Amato DeLuca said she was a student when she met Tamerlan Tsarnaev at a nightclub, introduced by one of her girlfriends. Tsarnaev, who had attended Bunker Hill Community College, was no longer in school, DeLuca said, and was seeing another woman at the time. Mosque: Tsarnaevs Were "Infrequent Visitors"
A Boston-area mosque says the Boston Marathon bomb suspects were infrequent visitors. Anwar Kazmi, Board Member of the Islamic Society of Boston, describes an incident where Tamerlan Tsarnaev became visibly upset with a sermon delivered there. "They went out for a while, and then they stopped and then they went out again," DeLuca said. Tsarnaeva knew nothing about Islam when they met, said her lawyer, adding he didn't know if marriage was a motivating factor in her conversion. The reason was that she is a believer, he said. "She believes in the tenets of Islam and of the Quran," DeLuca said. "She believes in God." The couple got married on June 21, 2010, a Monday, in a ceremony performed by Imam Taalib Mahdee, of Masjid al Qur'aan, in Boston's Dorchester neighborhood, according to their marriage certificate, which lists his profession as a driver. 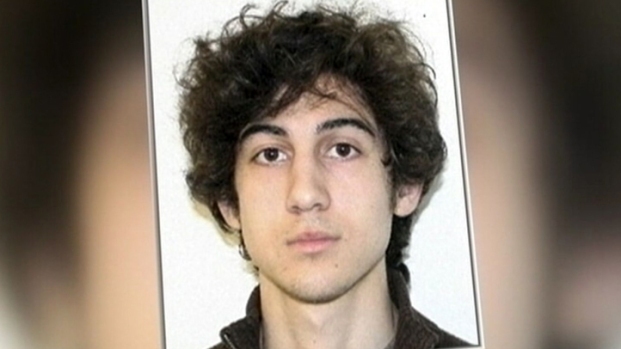 Mahdee told The Associated Press Tsarnaeva called him saying she and Tsarnaev wanted to get married. Mahdee asked if they had the requisite licenses and she said yes. Mahdee performed the 15-minute ceremony in the mosque office. Two witnesses were present, but Mahdee does not remember who they were. "They requested that it was a simple wedding," Mahdee said. Both seemed happy, he said. "They seemed like two people who were getting ready to get married," Mahdee said. Mahdee said he never saw the couple again and that they never attended his mosque. The couple had a daughter and lived with her in the Tsarnaev family apartment, which was shared over the years with his mother, Zubeidat, and father, Anzor, now divorced, and Dzhokhar, DeLuca said. He said Tsarnaeva rarely saw her brother-in-law there because he was living in the dorms at the University of Massachusetts Dartmouth. Tamerlan Tsarnaev's relatives have said that in recent years he became a devout Muslim and prayed five times a day. DeLuca said the couple attended a mosque in the Cambridge area. Nichole Mossalam, an executive assistant at the Islamic Society of Boston in Cambridge, near their home, said that Tsarnaeva had never been there to her knowledge. Leaders at the mosque say Tamerlan Tsarnaev did attend and in recent months had outbursts during two sermons that encouraged Muslims to celebrate American institutions such as the Fourth of July and figures including Martin Luther King Jr.
Tsarnaeva's lawyer said she had no reason to suspect her husband of anything and was focused on supporting her family, working 70 to 80 hours, seven days a week as a home health care aide. Her husband cared for their daughter when she was away, Deluca said. But Anne Kilzer, a Belmont, Mass., resident who went with her daughters to the Tsarnaev home to get facials from Tamerlan Tsarnaev's mother, said when she visited the apartment Tsarnaeva was always there with the baby and her mother-in-law. Kilzer, who had not been to the home since around Labor Day, when the mother told her she was leaving the country, described Tamerlan Tsarnaev as surly and intimidating and painted his wife as cowed and intimidated by him. She said Tsarnaeva seemed lonely and would bring out the baby for her to hold when she visited. The apartment was so cramped and crowded, Kilzer said, that it would have been difficult for Tsarnaev to hide criminal activity from his wife. Federal authorities have asked to interview Tsarnaeva, and DeLuca on Sunday told The Associated Press he is discussing with them how to proceed. He said on Tuesday during a brief statement to reporters that his client "is doing everything she can to assist with the investigation," although he would not answer questions about whether she had spoken with federal authorities. DeLuca would not give the AP details on what his client told him her husband was doing in the days before and after the April 15 bombing but said as far as he knew nothing seemed amiss to her in the days after. Tsarnaev was home when his wife left for work the last day he was alive, DeLuca said. Police say he was run over by a car driven by his brother as he fled gunfire early Friday morning. His brother was captured later that night, wounded and bloody, in Watertown, 10 miles west of Boston; his lawyer has declined to comment. DeLuca said she learned of her husband was suspected of being responsible for bombing the Boston Marathon the same way a lot of other people did: on TV. Her other lawyer, Miriam Weizenbaum, said on Tuesday that reports of her husband and brother-in-law's involvement in the bombings came as a shock to Tsarnaeva and her family and said she deeply mourned the loss of innocent victims. Tsarnaeva, she said, was trying to come to terms with the events.